Alison Ballance is a zoologist, wildlife film-maker, award-winning author, radio producer and expedition blogger. 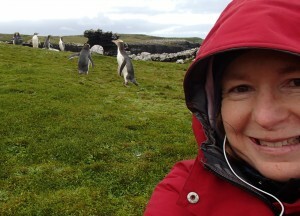 She joined Radio New Zealand’s weekly science and environment programme Our Changing World in 2008, after 18 years producing and directing wildlife documentaries for Dunedin-based TV production company NHNZ. Alison combines her search for great location-based radio stories with her passion for islands, remote wilderness and natural history, and despite getting seasick this quest has taken her to the four furthest points of New Zealand’s compass: Kermadec islands to the north, the Chathams to the east, Scott Base to the far south and West Cape in Fiordland to the west. She’s looking forward to exploring another new place at the Three Kings Islands in the company of some wonderful marine biologists. What do you hope to achieve on this expedition to the Three Kings? I’m looking forward to discovering some more of New Zealand’s amazing islands. I’ve never been to the Three Kings, but I’ve heard all about them, and I can’t wait to get wet and experience its amazing underwater world. I’m also really looking forward to being part of another Auckland Museum expedition, and to spending time with all the interesting folk who will be on board Braveheart. What skills are you bringing to the team? I’m going to be diving as part of the fish team, but I’ll also be recording the action for my radio programme Our Changing World. Best of all I’m going to be blogging again, just like I did for the Kermadec Biodiscovery expedition two years ago. I’ll be the boat-based voice of the trip, keeping you all up-to-date with everyone’s discoveries and all the daily excitement in words, photos, and on video. In my job as radio producer I do a bit of everything. I find people with good stories to tell, I research their work, go out into the field or lab with them to record sound-rich radio interviews, and then I edit all the audio together and help produce the weekly programme. The best bit of my job is definitely getting out to some great locations, seeing all sorts of plants and animals, and meeting passionate people who know heaps more than I do about all sorts of stuff and who don’t mind sharing it on radio.